I often hear myself telling people that I can’t drive a car. Don’t know how, never learned. It’s boring to have to explain this, but sometimes I meet people who think it’s odd to the point of being problematic somehow, so I tend to announce it upfront so that I won’t have to spring the terrible surprise on them later in our relationship. I grew up in an urban area with good public transportation, I always say. Learning to drive a car seemed like an unnecessary added stress, so I just never bothered. I’m aware that not driving is kind of weird for the same reason I’m aware that a lot of things about me are unusual—not because I think they are, but because other folks seem to. Truly, I don’t imagine anyone cares much about the details of my personal choices, but it does get to be a drag trying to justify my lack of a driver’s license to people who can’t imagine living without one. It’s like what Divya, a young woman in my writing workshop, said about art museums: They’re one of the few places where it’s not socially awkward to be alone. That’s just how I feel on the train, which I can’t help but think of as a place to see and be seen. People who live much of their lives in public this way make an effort with their hair and clothes, I find, even when they’re just going to the store. I take a cue from those folks, trying out new outfits for the runway that is the aisle between two rows of seats. This is Philadelphia, so the bus can be smelly or too hot or, with people arguing with the driver over the fare or a missed stop, tiresome. But it can be unexpectedly glamorous, too. Image: Josephine Pryde, Here Do You Want To, 2014, giclée print, 23 1/4 × 15 1/2 inches. Courtesy the artist and Reena Spaulings Fine Art, New York; Simon Lee Gallery, London; and Galerie Neu, Berlin. Image: Josephine Pryde, Gift For Me, Simon Lee Gallery Christmas 2013 (1), 2015, giclée print, 23 1/4 × 15 1/2 inches. Courtesy the artist and Reena Spaulings Fine Art, New York; Simon Lee Gallery, London; and Galerie Neu, Berlin. In Pryde’s show at the University of Pennsylvania’s Institute of Contemporary Art, we see a series of close-up photographs of people’s hands with brightly painted nails, several of them holding smart phones. The nails seem to be the point of the photos, like a beauty spread in Glamour or Allure, or an ad. 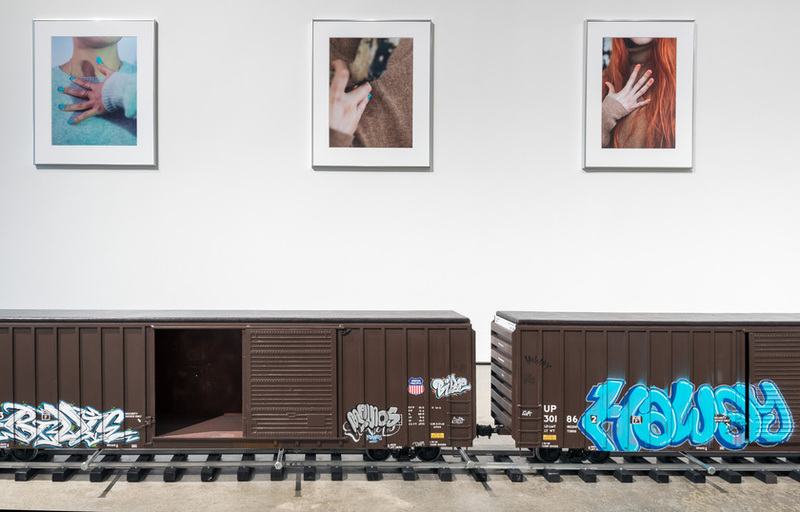 To view them, visitors can sit on a model of a freight train—perfectly detailed with bubbled tags painted on the side, not by Pryde but by a graffiti artist—and ride past on a track temporarily installed on the floor. It’s not unlike the sensation of taking the train to work and peeping on your fellow riders—who expect to have their pretty nails admired as they poke at their phones—as you trundle through the city on some beat-up conveyance that has been jazzed up itself by a graffiti painter who wants you to admire his attempts as beautification, too. The photos call to mind modern junk culture—fashion magazines, graffiti, cell phone chatter—and ask us to see them in the context of, ya know, real art. Here, the only “painting” is a reference to street art, and the advertising language of fashion photography is what hangs on the gallery wall. After we visited the show with our class, I went home and painted my nails, which suddenly looked plain and boring to me. I told this to everyone when we met again the next day to write about what we’d seen, and another woman said, “The same thing happened to me!” Looking, I’m always looking at other people, at other women, for cues on how to be. I guess I’m not the only one. When I ride the 61 bus down Ridge Avenue, I can spy on things and people as they slide past my view. I can also see, through the crowd, details here and there of my fellow riders. Not usually the whole picture-not in person, cuz it’s impolite to stare. I’ll catch a glimpse of an old man’s hand in his lap, his yellowed nails. A thick gold chain necklace looks fantastic on a woman’s pure white cable-knit sweater: I’ll have to remember that for myself. A trio of teenage girls have each made tiny tweaks to their school uniforms to express an identity: slouchy knee socks, a shortened skirt, bright laces in the brown shoes. A tiny baby lies on its back and stares up at the ceiling, its eyes unfocused but bright. The crinkles on an old lady’s face, with soft red cream rubbed into her cheeks and a natty felt hat, so like something my grandmother would have worn. She grew up not far from here, come to think of it, just a mile or so back from the river. It’s the feeling of movement that excites me, even more than the seeing, and the way the motion affects the way that I see. It makes the world-or my time to experience it, anyway-seem as fleeting as it is, everything tearing past almost before I get to know it, everything ending even as it’s beginning. It just feels correct to me, a reminder that we’re always in motion, moving inexorably toward some unknowable end. I used to play a game with myself every time I rode a train or a bus, or found myself in an especially crowded and warm bar at night, with the soft lights glowing and people around me laughing. Quick look around to assess the ages of the everyone there so I could then thrill myself by saying, “In X years EVERYONE ON THIS TRAIN will be DEAD!” Including me, of course, the center of it all. We had longer, as a group, if there was a baby on board; the thought was more sobering when the youngest person there was me. Maybe I’ve outgrown that game now, but I used to love the sweet melancholy pang I’d get when I thought of it. We’re here now, dammit! Life is for the living! Better take a look around while you still can. Next Post I’ll get the CARDS out on TIME, OKAY?